The QListWidget class provides an item-based list widget. QListWidget is a convenience class that provides a list view similar to the one supplied by QListView, but with a classic item-based interface for adding and removing items. QListWidget uses an internal model to manage each QListWidgetItem in the list. 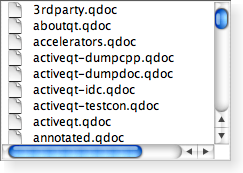 For a more flexible list view widget, use the QListView class with a standard model. The selectionMode() of a list widget determines how many of the items in the list can be selected at the same time, and whether complex selections of items can be created. This can be set with the setSelectionMode() function. If you need to insert a new item into the list at a particular position, it is more required to construct the item without a parent widget and use the insertItem() function to place it within the list. The list widget will take ownership of the item. For multiple items, insertItems() can be used instead. The number of items in the list is found with the count() function. To remove items from the list, use takeItem(). The current item in the list can be found with currentItem(), and changed with setCurrentItem(). The user can also change the current item by navigating with the keyboard or clicking on a different item. When the current item changes, the currentItemChanged() signal is emitted with the new current item and the item that was previously current. A Windows XP style list widget. A Macintosh style list widget. A Plastique style list widget. 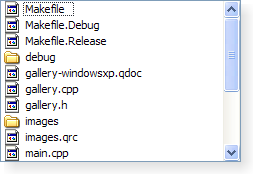 See also QListWidgetItem, QListView, QTreeView, Model/View Programming, and Config Dialog Example. This property holds the number of items in the list including any hidden items. This property holds the row of the current item. Depending on the current selection mode, the row may also be selected. If this property is true, sorting is enabled for the list; if the property is false, sorting is not enabled. The default value is false. Constructs an empty QListWidget with the given parent. Destroys the list widget and all its items. Inserts an item with the text label at the end of the list widget. Inserts the item at the the end of the list widget. Warning: A QListWidgetItem can only be added to a QListWidget once. Adding the same QListWidgetItem multiple times to a QListWidget will result in undefined behavior. Inserts items with the text labels at the end of the list widget. Removes all items and selections in the view. Closes the persistent editor for the given item. This signal is emitted whenever the current item changes. The previous item is the item that previously had the focus, current is the new current item. This signal is emitted whenever the current item changes. The currentRow is the row of the current item. If there is no current item, the currentRow is -1. This signal is emitted whenever the current item changes. The currentText is the text data in the current item. If there is no current item, the currentText is invalid. Handles the data supplied by a drag and drop operation that ended with the given action in the given index. Returns true if the data and action can be handled by the model; otherwise returns false. Starts editing the item if it is editable. Finds items with the text that matches the string text using the given flags. Returns the QModelIndex assocated with the given item. Inserts the item at the position in the list given by row. Inserts an item with the text label in the list widget at the position given by row. Inserts items from the list of labels into the list, starting at the given row. See also insertItem() and addItem(). Returns the item that occupies the given row in the list if one has been set; otherwise returns 0. This signal is emitted when the item is activated. The item is activated when the user clicks or double clicks on it, depending on the system configuration. It is also activated when the user presses the activation key (on Windows and X11 this is the Return key, on Mac OS X it is Ctrl+0). Returns a pointer to the item at the coordinates p.
Returns a pointer to the item at the coordinates (x, y). This signal is emitted with the specified item when a mouse button is clicked on an item in the widget. See also itemPressed() and itemDoubleClicked(). This signal is emitted with the specified item when a mouse button is double clicked on an item in the widget. See also itemClicked() and itemPressed(). This signal is emitted when the mouse cursor enters an item. The item is the item entered. This signal is only emitted when mouseTracking is turned on, or when a mouse button is pressed while moving into an item. Returns a pointer to the QListWidgetItem assocated with the given index. This signal is emitted with the specified item when a mouse button is pressed on an item in the widget. See also itemClicked() and itemDoubleClicked(). This signal is emitted whenever the selection changes. See also selectedItems(), isItemSelected(), and currentItemChanged(). Returns the widget displayed in the given item. Returns a list of pointers to the items contained in the data object. 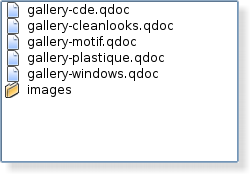 If the object was not created by a QListWidget in the same process, the list is empty. Returns an object that contains a serialized description of the specified items. The format used to describe the items is obtained from the mimeTypes() function. If the list of items is empty, 0 is returned rather than a serialized empty list. Returns a list of MIME types that can be used to describe a list of listwidget items. Opens an editor for the given item. The editor remains open after editing. Removes the widget set on the given item. Returns the row containing the given item. Scrolls the view if necessary to ensure that the item is visible. The hint parameter specifies more precisely where the item should be located after the operation. Returns a list of all selected items in the list widget. Sets the current item to item. Depending on the current selection mode, the item may also be selected. Sets the widget to be displayed in the give item. This function should only be used to display static content in the place of a list widget item. If you want to display custom dynamic content or implement a custom editor widget, use QListView and subclass QItemDelegate instead. See also itemWidget() and Delegate Classes. Sorts all the items in the list widget according to the specified order. Returns the drop actions supported by this view. Removes and returns the item from the given row in the list widget; otherwise returns 0. Items removed from a list widget will not be managed by Qt, and will need to be deleted manually. Returns the rectangle on the viewport occupied by the item at item.